If you live in Canada use this theme day prior to or after the July 1st activities in your community celebrating Canada Day. If you don’t live in Canada use this theme day as a way to explore another country at any time of the year or on July 1st. Print out the Family Theme Day Planner and decide which activities you’d like to do and in what order. 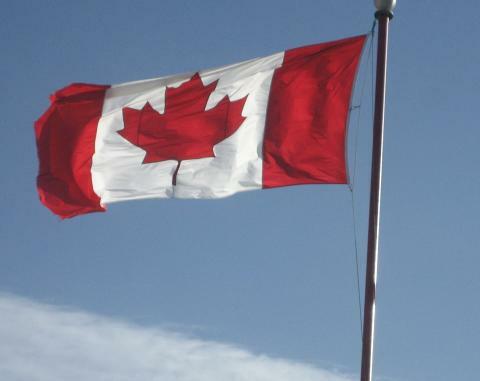 Canada has a holiday called Canada Day which is celebrated on July 1st. It is a celebration of the anniversary of the enactment of the British North America Act (the Constitution Act, 1867), which united two British colonies and a province of the British Empire into a single country called Canada in 1867. For another Canadian song for this theme day try to find a version The Maple Leaf Forever” (like the one by Michael Bublé from the Vancouver 2010 Winter Olympics which you can listen to here along with still shots from the closing ceremonies: http://www.youtube.com/watch?v=4WHbj4_y8q8). You can find many free colouring pages online by using your favourite search engine and typing in “Canada Day Colouring Pages” or “Canada Coloring Pages” or print out my Beaver and Maple Leaf Colouring Page. Write out one or more of the following questions in the family notebook or on a piece of paper to glue in your family scrapbook: How many provinces and territories from Canada can you name? How many provinces/territories in Canada have you been too? What cities in Canada have you travelled to? Where in Canada would you like to travel? What do you know about the Canada? ¨ Preschooler/Kindergartener – discuss the answer(s) out loud first and write the answer down for him/her leaving one word for him/her to write out himself/herself with your help. You could also encourage him/her to draw a picture as well. ¨ Early Grade School – have your child either write out the answer himself/herself (encourage phonetic spelling) without your help, or offer to help with spelling each word out loud one word at a time. ¨ Older Child – have your child write a longer response (paragraph). 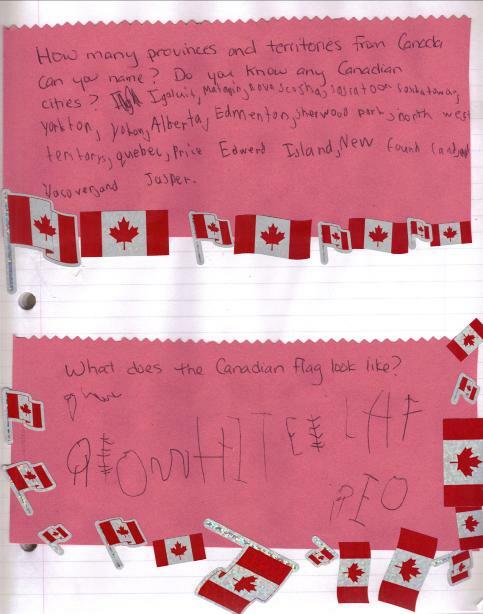 ¨ As A Challenge – instead of a question ask your older child to write a story about Canada. Easy Canada Word Search or Difficult Canada Word Search. Easy Canada Word Search Key or Difficult Canada Word Search Key. Raid your child’s bookshelves to find any books about Canada or Canada Day. Go to the library with your child to find some books about the country of Canada. Go to the library on your own to find books about Canada or Canada Day from both fiction and nonfiction to have already on hand for your theme day. Many libraries allow you to go online and search for titles based on subject (search for “Canada” or “Canada Day” under “children’s Books”). Reserve them if you can to save time. · The Canadian Shield Alphabet, written by Myrna Guymer and illustrated by RoseMarie Condon, Your Nickel’s Worth Publishing, 2008 – This alphabet book has alliterative text for each letter of the alphabet plus a box on each page with additional information about the topic presented (birch bark biting, canoe portaging, dog sledding...). · Eh? To Zed: A Canadian ABeCedarium, by Kevin Major and illustrated by Alan Daniel, Red Deer Press, 2000—Featuring alphabetical words in rhyming verse this book shows many things unique to Canada (and it includes further description/explanation of each word at the back). · A Halifax ABC, by Yolanda Poplawska, Nimbus Publishing Ltd., 2005 – The colourful illustrations, by a graphic designer from Halifax, in this alphabet book highlight different things seen in Halifax, Nova Scotia, and surrounding areas. · One is Canada, by Maxine Trottier and illustrated by Bill Slavin, Harper Collins Publishers Ltd., 1999—This counting book (from 1 to 10) includes wonderful illustrations and a rhythmical pattern in its text. · Canadian Wild Animals, by Colleayn O. Mastin and illustrated by Jan Sovak, Grasshopper Books Publishing,1997—Features 15 wild animals found in Canada. Each excerpt on each animal starts with a two verse rhyming poem and then includes factual text. · I Am Canada, by Heather Patterson, North Winds Press, 2006 – Simple text accompanies photographs of Canadian children. · The Kids Book of Canada, written by Barbara Greenwood and illustrated by Jock MacRae, Kids Can Press Ltd., 1997—This is like a kids encyclopaedia of Canada. It examines each province and has lots of information including history, the coat of arms and flag for each province, animals, people, places and events etc..
· Wow Canada! Exploring This Land From Coast to Coast, by Vivien Bowers and illustrated by Dan Hobbs and Dianne Eastmen, Maple Tree Pres, 1999—Narrated by the 12 year old character Guy who along with his 10 year old sister Rachel go on an across Canada vacation with their parents, this book examines each province with quite a lot of detail. It includes photographs and souvenirs and comics along the way and even includes letters and lists which make this a fun book for older kids to read. · Eenie Meenie Manitoba, written by Robert Heidreder and illustrated by Scot Ritchie, Kids Can Press, 1996—Full of fun little poems with a Canadian twist each can be used for ball-bouncing, skipping, or clapping among other actions. NOTE: On Canada Day most Canadian communities have special celebrations and end the day with fireworks. Make this craft to create your own fireworks for Canada Day. Step 1: Put a few drops of paint in each container and add water to make a very runny paint. 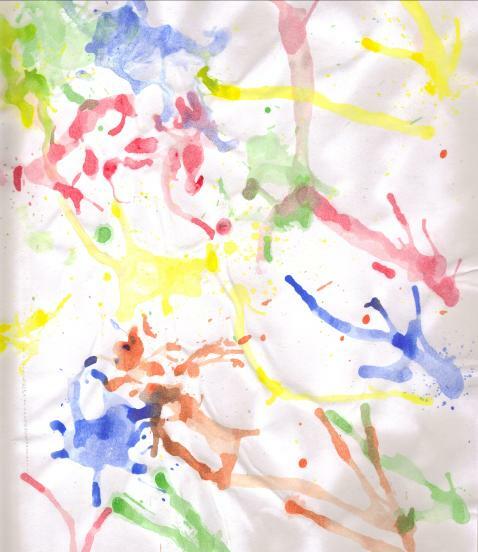 Step 2: Drip the straws in the paint and show your child how to blow through the straw to splatter the paint across the paper (you can also dip the straw in water then cover it with your thumb to hold some paint in and then release it over the paper). Step 3: Show your child how to tilt the straw and blow the paint that is already on the paper to make it stretch out and colour the paper in streaks that look like fireworks. Step 4: Let your child add more paint and blow to make watery streaks. Step 5: Let it dry then display or glue in your Family Theme Day Scrapbook. NOTE: The National Animal for Canada is a beaver. Make this puppet to honour the hardworking animal. Materials: One paper bag, white paper, brown paper, child safe scissors, black marker or crayon, glue stick, damp cloth for sticky fingers. Step 1: Have your child draw two eyes using the black marker or crayons on white paper. Help your child to cut them out. Step 2: Help your child cut out a rectangle for the beaver teeth from the white paper. Step 3: Help your child cut out four ovals from the brown paper for the beaver’s paws and one large oval for the beaver’s tail. Step 4: With the fold of the paper bag facing you have your child glue the two eyes to the fold. Step 5: Have your child draw a black nose under the eyes on the fold of the paper bag. Step 5: Have your child glue the white teeth attached to the fold underneath it. 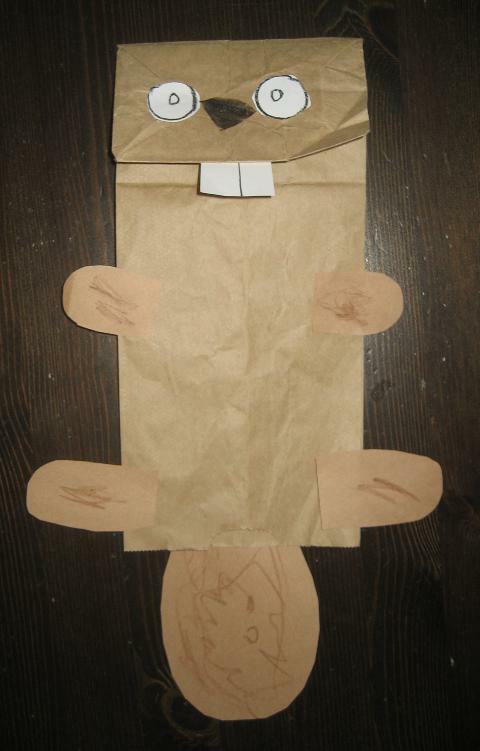 Step 6: Have your child glue the beaver’s oval paws to the sides of the paper bag. Step 7: Have your child glue the beaver’s tale to the back of the paper bag hanging down past the opening of the bag. Step 8: Let it dry then use it as a puppet. Materials: One large leaf (if you can find a maple leaf use that but we couldn’t find one so we used the largest leaf we could find), white paper, red crayon. Step 1: Lay the leaf under the paper so it is positioned in the middle. Step 2: Using the side of the crayon help your child rub over the spot where the leaf is to leave a rubbing print of the leaf on the paper. 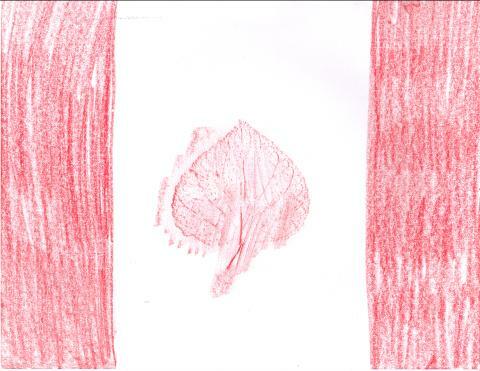 Step 3: Have your child colour red on two sides of the paper to make the Canadian flag. Step 4: Display or glue in your Family Theme Day Scrapbook. Ingredients: Slice of bread, cream cheese, strawberry or raspberry (red) jam, a strawberry, two dried cranberries. This recipe makes two flag snacks. Step 1: Toast the bread if your child prefers but it doesn’t need to be. Step 2: Cut the slice of bread in half. Step 3: Spread cream cheese in the middle of one of the rectangular bread slices for the white part of the Canadian Flag. Step 4: Spread red jam on either side on the white cream cheese. Step 5: Cut the strawberry in half lengthwise and place one slice on the cream cheese (with the tip of the strawberry upwards). 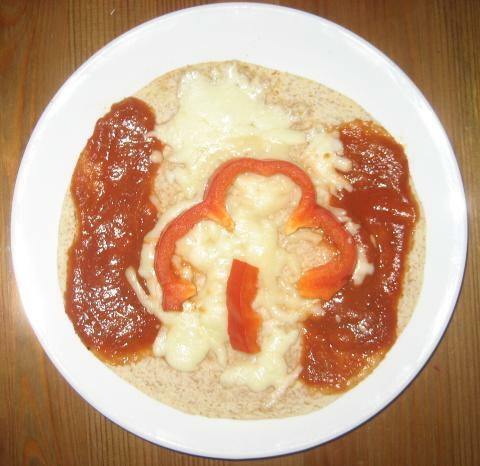 Ingredients: large pitas or tortillas, tomato/pizza/pasta sauce, shredded mozzarella cheese, red pepper slices (cut horizontally. Step 1: Place pitas/tortillas on a baking sheet. Step 2: Sprinkle mozzarella cheese down the middle of the pita as the white part of the Canadian Flag. Step 3: Spread tomato/pizza/pasta sauce ream cheese in the middle of one of the rectangular bread slices for the white part of the Canadian Flag. On Canada Day many Canadian’s celebrate with a Barbeque. For this theme day have your own Barbeque and serve up your family’s favourites like hot dogs or hamburgers. 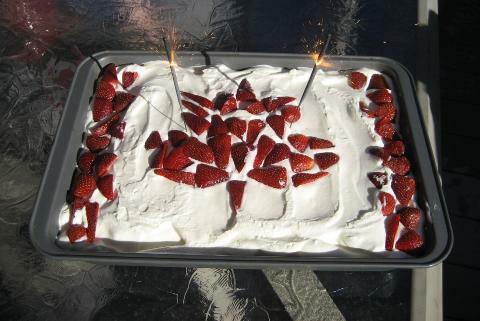 It’s easy to make a Canadian Flag Cake for this theme day. Just bake your favourite type of cake in a rectangular cake pan and spread with white icing. 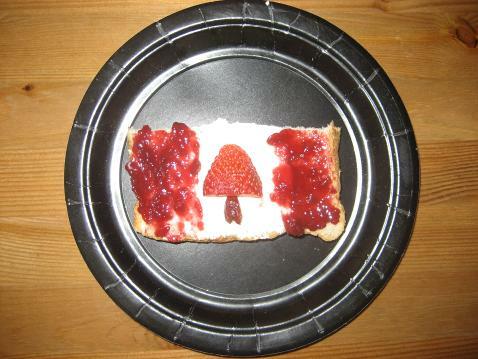 Arrange sliced strawberries in the shape of a maple leaf in the middle and along the sides. 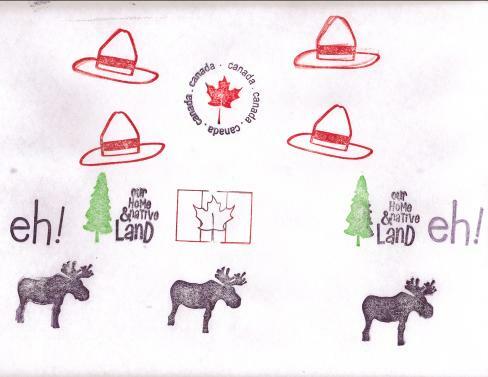 Print out a copy of my Canadian Flag Worksheet and have your child colour it the appropriate colours. Print out a copy of my Canadian Geography Worksheet and have your child colour it (my apologies for any missing islands and misshapen provinces or territories in my drawing). Together try to match the names of the various provinces and territories of Canada. Check here for the Canadian Geography Answer key. Print out a copy of my Canadian Capital Cities Matching Worksheet and work together to match the provinces/territories with the appropriate capital city. Check here for the Canadian Capital Cities Key. Search through your child’s DVD/ video collection (or visit your local library before hand or the Video Store) to see if any of your child’s favourite shows are about Canada or take place there. 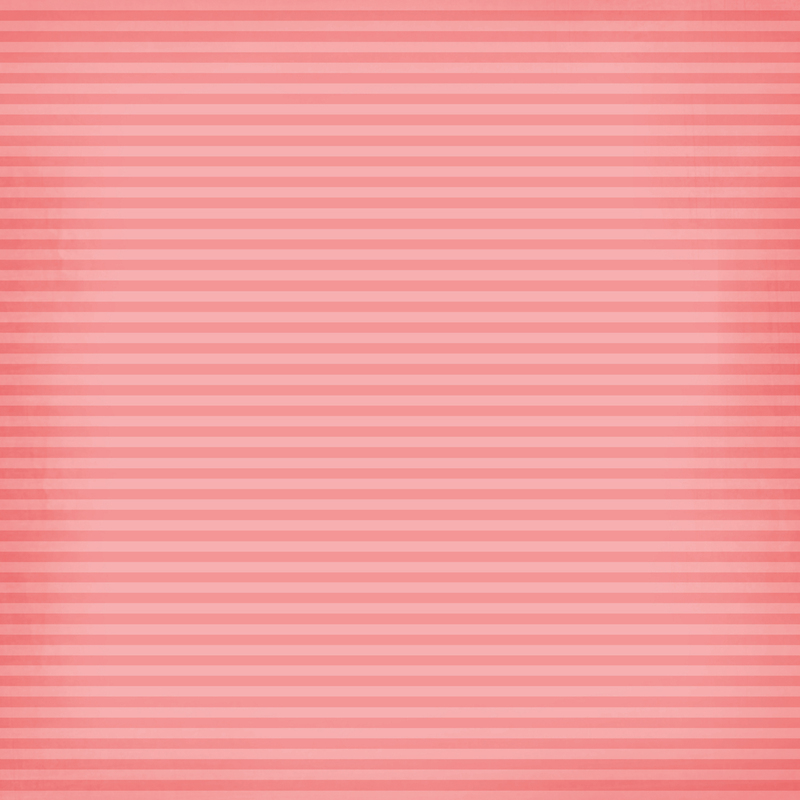 · Are We There Yet? World Adventure: Episode #4—Canada, McNabb Connolly, 2007—two kids explore three different parts of Canada (Churchill to see the Polar Bears, Ottawa for Canada Day, and Algonquin Park). · The History of Canada, Schlessinger Media, 2004– this is a 23 minute program (there are also 2 others in the series: The Culture of Canada and The geography of Canada) . · Time Trackers: History Volume 1, tvo kids, 2005—This features four short segments on 4 historical Canadians (Sir John A. MacDonald, Joseph Tyrell, Laura Secord and Tom Longboat). Host your own Canada Day picnic or Barbeque for this theme day. 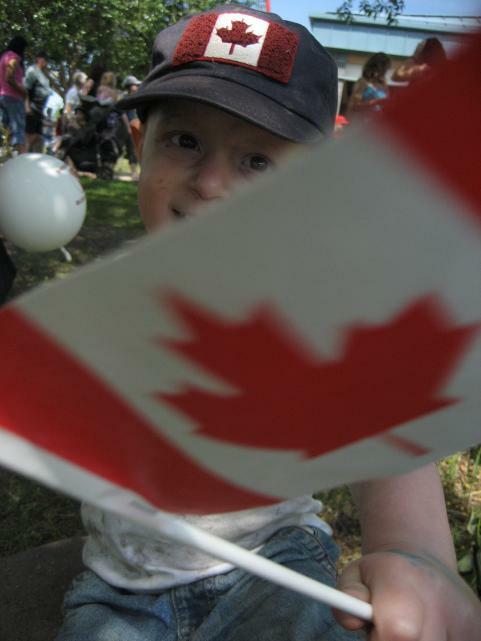 If you live in Canada or are visiting on Canada Day attend local festivals, parades or fireworks to celebrate.